Hoy en mis amigos con estilo le tomé una foto a Enrique, uno de mis amigos más queridos aquí en Buenos Aires, y que por cosas de la vida ayer partió a Bogotá. No quería que se fuera sin tener una foto de su look, recuerdo que lo conocí hace casi 10 años, y la primera vez que lo ví tuve un crush con él porque era él que más onda tenía en la fiesta. Es un ciudadano del mundo para mí, y eso se refleja en su forma de vestir, y de ser. Le dije que se pusiera algunas cosas que fueran sus favoritas, y por eso usó su gorrito nuevo Quiksilver, un sueter militar Gap, Jeans Felix y sus dunks Nike que ahora las ama más porque su roommate le hizo un entrelazado especial a las trenzas. Today on "My friends look cool too" I have my beloved friend Enrique, one of most special friends here in Buenos Aires, but for personal reasons, he just moved to Bogotá, Colombia. I didn't want him to leave without having a picture of his look, I remember when I met him 10 years ago I immediately had a crush on him because he was the coolest best looking guy at the party, and now he still does, but I no longer have the crush on him hahaha, though I love him to death. He's a citizen of the world to me, and that reflects his way of living and dressing up. I told him to wear his favorite things, and that's why he wore his new fave red beanie from Quiksilver, a military shirt from Gap, jeans from Felix and his Nike dunks which he's loving even more since his roommate made him a special twist on the way shoelaces are supposed to be. 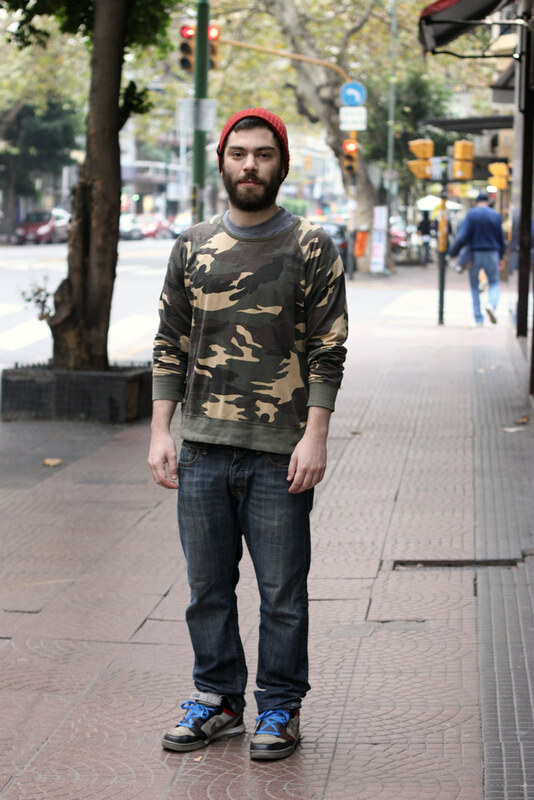 me encanta el print militar! Vaya estilazo tiene Enrique ! como me gustan sus zapas!